To dive Vancouver Island, north of Parksville BC is generally a little better mainly due to water clarity. The main factor seems to be that as you get farther north of the Fraser River, the runoff has little or no effect. I have been fortunate to have had the opportunity to dive a little on the northern portion of Vancouver Island and plan to do a lot more. The absolute best Vancouver Island diving is up in Browning Pass where there are many excellent dive sites offering shear walls, reefs, and even a natural wreck SS Themis that went down in 1906. All of these sites are loaded with life and can be accessed by safe drift diving from a live boat through the knowledgeable services of John de Boeck, owner operator of The Hideaway resort. Browning Pass and The Hideaway Resort are located in the Gordon Group of islands just north of Port Hardy. six gill shark sightings at nearby Flora Islet, or the guarantee of sea lions at Norris Rocks. Sea lion dives can range from a little amusing through to very intimidating at times. 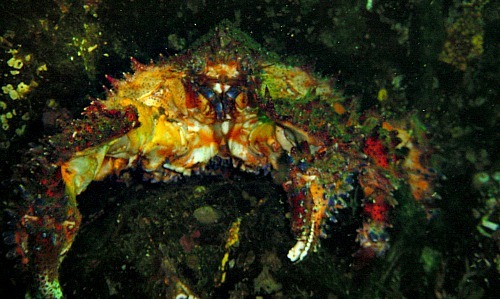 Campbell River and Quadra Island also offer some great dive sites, like Tyee Spit, Rebecca Spit, Wa-Wa-Ki Beach, and Whiskey Point to name some of the most popular ones. There is lots of great diving here that I am looking forward to exploring. No matter your skill level, there is easy shore access to high current dives, night dives, wreck penetration, or for whatever your passion is, there is great diving available for all. The island is also a photographers paradise with many opportunities. Whether stills, macro, or video, you will love it.